Bart Ehrman has published an argument concluding the conversation between Jesus and Nicodemus in Jn 3 “could not have happened, at least not as it is described in the Gospel of John” (Bart Ehrman, Jesus Interrupted, p. 155). We present Ehrman’s argument here with brief critique. As a preview, our main gripe with Ehrman’s presentation (more fully explained below) is that whereas Ehrman supposes an original Aramaic conversation between Jesus and Nicodemus would necessarily have had Jesus using an Aramaic word which can only mean “from above,” but not “second time,” it turns out the ancient Aramaic versions we do actually have, such as the Syriac Peshitta, have Aramaic men derish (“again” -or a second time- …which can indeed also mean “from above,” or lit. “from the head” Both the Greek text and Aram. translations suggest two possibilities: (1) the possibility of an original Aram. conversation (with Ehrman we presume Christ and Nicodemus would have probably spoken Aramaic, from which the Gospel of John was translated into Greek) with double entendre on men derish or (2) the possibility that the narrative considered from the perspective of both Aramaic and Greek reads just fine with a single meaning of either ανωθεν/anothen (Gk.) or men derish (Aram.) in view, as “again” without inductively presuming there absolutely had to have been an original double entendre (which is certainly possible, but is not an absolute exegetical necessity, but an inference, however plausible it may be made to seem by ancillary arguments). Either way, (1) since there is an Aramaic word that allows the double entendre, or (2) since it is not an absolute exegetical necessity to presume the narrative requires a double entendre in the first place, Ehrman’s novel argument has come to ruin. “In the Gospel or John chapter 3, Jesus has a famous conversation with Nicodemus in which says, “You must be born again.” The Greek word translated “again” actually has two meanings: it can mean not “a second time” but also “from above.” Whenever it is used elsewhere in John, it means “from above” (Jn 19:11, 23). That is what Jesus appears to mean in John 3 when he speaks with Nicodemus: a person must be born from above in order to have eternal life in heaven above. Nicodemus misunderstands, though, and thinks Jesus intends the other meaning of the word, that he has to be born a second time. “How can I crawl back into my mother’s womb, he asks, out of some frustration. Jesus corrects him: he is not talking about a second physical birth, but a heavenly birth, from above. This conversation with Nicodemus is predicated on the circumstance that a certain Greek word has two meanings (a double entendre). Absent the double entendre, the conversation makes little sense. The problem is this: Jesus and this Jewish leader in Jerusalem would not have been speaking Greek, but Aramaic. But the Aramaic word for “from above” does not also mean “second time.” This is a double entendre that works only in Greek. So it looks as though this conversation could not have happened—at least not as it is described in the Gospel of John” (Bart Ehrman, Jesus Interrupted, p. 155). Note that Ehrman does not actually specify what exact Aramaic word or phrase he has in mind. We will proceed on the assumption that the Aramaic men derish in the Syriac Peshitta (and also the Old Syriac) could have served nicely in an original Aramaic conversation with Jesus and Nicodemus, later translated into Koine Greek in the Gospel of John narrative, and still later translated into our early Aramaic versions which are still extant using the Aramaic men derish. As we have seen, (1) if we presume double entendre, men derish (lit. from the head) s translated “again” -i.e. a second time, and serve the purpose of double entendre just fine; but that, alternately, (2) if it is not absolutely irrefutable to presume double entendre in the Greek narrative (which it isn’t) the narrative in both Gk. and Aram. could make perfect sense understanding the respective words to simply mean “again” without any double entendre. Let us look at possibility (2) more closely. Verse 4 follows quite nicely from verse 4 in the Peshitta under the second hypothesis Nicodemus would have understood “again” in vs. 3 to mean… well.. “again“(! ), and his reply in vs. 4 would have made perfectly good sense -no “double entendre” required (nor was it ever supposed by any of the numerous early ancient translations of the Greek NT into other languages (versions), all of which simply render Jn 3:3 with equivalents of “again.” In the ancient world it seems the natural reading “again” was obvious and unanimous. No direct ancient evidence for anything else exists in Aramaic, Coptic, Ethiopic, Latin, or any other language into which the Greek text was translated). 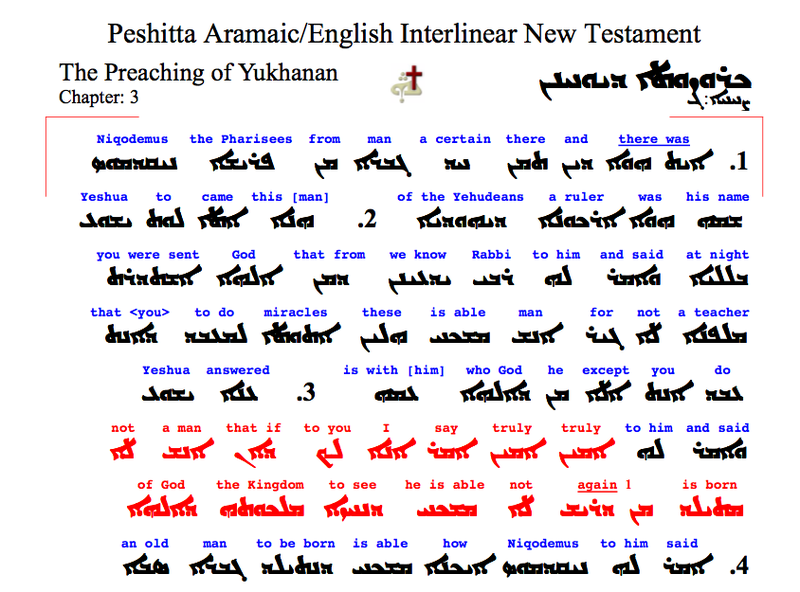 Here also is an interlinear translation from peshitta.org with Jn 3:3 in red; the footnote to their English rendering “again” has Lit. ‘from the start’ (‘over again’). The final bone we have to pick concerns Ehrman’s monolithic/uncompromising understanding of the Greek text. Maybe ανωθεν was meant to convey the same meaning in John 3 and maybe it wasn’t. If it wasn’t there is no problem with the consistency of the narrative either originally understood or subsequently translated as “again” in either Greek or Aramaic. If it was, the Aramaic men derish, literally “from the head” also means “again” and is so translated in every major English translation of the Aramaic version into English, so there is no problem supposing an original dialog in Aramaic with a double entendre. Unless the majority not only “might” be wrong to translate John 3:3 as they have, but are absolutely and definitively incorrect, Ehrman’s argument has lost its punch at the level of the Greek text in addition to having completely evaporated at the level of his assertions about an underlying Aramaic narrative. But even on the assumption, with no argument in Ehrman’s book, that the preferred rendering of a majority of our major English translations of the Greek narrative were just flat wrong, that too would work out fine if an original Aramaic narrative had men derish where John used anothen. The narrative potentially reads just fine in both languages on either assumption about the correct meaning of anothen. Ehrman’s novel argument is creative, but it fails to convince. Cf. http://dukhrana.com/lexicon/PayneSmith/index.php?p=540 Etheridge, Murdock, Bauscher, Lamsa, and peshita.org all render it as “again” or “anew.” Men derish suggests from the “head” or beginning of a process (cf. Heb. bereshith: “in the beginning”). Men derish also occurs in the Old Syriac version. 11 Responses to The “Born Again” Narrative in John 3: An Aramaic Impossibility? Well, No! Is this one of Ehrman’s big arguments? Not much of one if it is. Great article! It seems as though a lot of modern controversy in the academic community stems from people needing fresh thesis/dissertation ideas, or having books or other written works to sell. I suspect this is Ehrman’s issue. Bart Ehrman did originally make me doubt the coherence of this text. This article was very helpful to restore my faith. It would be good, if more detailed academic comments appear on this site. Do you mean by accident an aramaic phrase became a greek word play after translation? Wordplay/double entendre is a late hypothesis rather than a certain or indubitable datum of the Greek text of John 3:3 or necessary/inescapbable conclusion about the text. This was one of the points made in the original essay. If an original Aramaic conversation could have taken place which was similar to what we find in the Peshitta the most natural translation into Greek would be exactly what we find in the Greek text. Conversely, on any hypothesis that it is “inaccurate” to take the Greek text as intending the perfectly natural and usual meaning, “again,” one must explain why on earth the earliest ancient versions uniformly rendered the text of John in precisely that way (e.g. 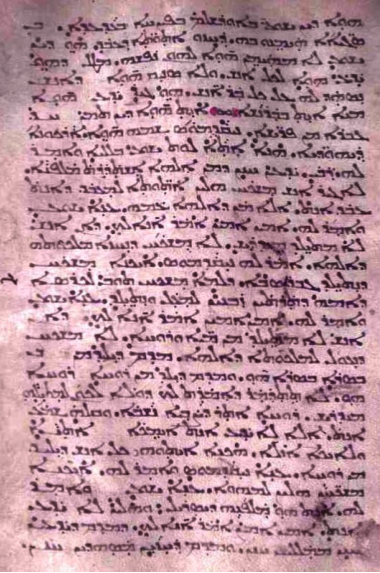 Aramaic, Coptic Sahidic, Bohairic, Latin and other early versions), as “again.” In other words one has to then argue it is impossible that the Greek can be taken simply as saying “again” even though that’s exactly what a majority of very early ancient translators, who were quite adept at their craft at a time when Greek was still a living language, did in fact take it to mean. Ehrman’s “argument” is even dumber: the Aramaic literally means “from the head/top/start” etc. (lit. “from of-head”), the double entendre existing in Aramaic as well as the Greek. 2 top Com. –(a) fig. : top, best, choice Com. (a.1) choice, first quality Gal, PTA. (a.2) best Syr. (a.3) preferred position Syr. –(b) lit. top, thing on top Com. (b.1) in compounds : the top thing . 1 ܪܝܫ ܐܣܬܐ : top of the wall, capstone Syr. 4 ܪܝܫ ܦܪܨܘܦܐ : forehead Syr. 3 beginning OfA, Gal, Syr. –(a) first part of a tannaitic statement Gal, JBA. –(b) firstfruits Syr. –(c) in compounds : the first thing, beginning . 4 capital funds OfA. –(a) ריש כיסא : principal JBA. 5 tip, extremity Gal, Syr. –(a) bit ri$ end place, i.e. goal? Man. 6 chief Palm, PTA, Syr. –(a) in compounds: chief X . 7 major section Com. –(a) chapter Syr. –(b) region Syr. (b.1) band Syr. –(c) principal organ Syr. 8 in compounds: s.t. characterized by being a head or top of s.t. . –(a) ܪܝܫ ܕܟܪܐ : battering ram Syr. –(b) ܪܝܫ ܕܒܒܐ ̈ ܡܝuܼoܟܸܦܗܲܠoܢ ܥܲ ܕܼܣܸܲܣܸܐ Syr. 9 adv (various) Syr. –(a) ܡܢ ܕܪܝܫ again (see also s.v. mryš) Syr. –(b) mn riš briš again and again, i.e. forever Man. –(c) בריש adv./prep. see s.v. bryš OfA, JLAtg. –(d) ܩܘܡ ܪܝܫܐ : to do something first, most importantly Syr. 10 center, point Syr. –(a) source Syr. (a.1) ܪܝܫ ܡܒܘܥܐ : the source of a spring Syr. 11 poison [Heb. ראש , רוש ] JLAtg, Syr, LJLA. For ראש in the Edumean ostraca see discussion s.v. rwš n.
LS2: 1462. DJPA: 510a. DJBA: 1078b. Jastrow: 1477. DNWSI: 1042. 1 at first, formerly JBA. To Isa. Thank you so much for an in-depth linguistic analisys of the Aramaic substratum. Knowing the original tongues (not just koine Greek) helps to have the whole picture, rather than a (distorted) part of it. As Ricky Ricardo would say, Ehrman…you got some splaining to do. I made the same exact argument when I encountered the Bart claim that it could not have come from the Aramaic. I’m glad to find someone to second my reading. Good post. I was confused when I read Ehrman’s article — I thought to myself if he might be on to something, if some of Jesus’ conversations really were a linguistic impossibility in Aramaic. It appears as though Ehrman didn’t give any alternatives to his own look at the picture.